Finding a light-duty pickup truck might be a task that you find difficult to complete. 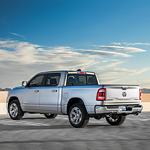 The popular Ram 1500 is a good pick for you and a vehicle that has a special exterior. There are certain lights on a vehicle that can help that vehicle capture the attention of drivers who are traveling near it. The full LED headlights on the Ram 1500 help this vehicle to get a lot of attention. These lights also help you show up when you need to, and they help to keep you safe. The rear of a vehicle should look every bit as good as the front and it should have special details to it that help it to stand out. The specially designed rear of the Ram 1500's exterior will impress you. There is an integrated spoiler at the rear of this vehicle, a special detail that was added to the tailgate.